If you follow my blog long enough, you should probably know who’s my baby Vicky. If you don’t, baby Vicky is actually a car I bought when I was 19. Yes, bought it all by myself at the age of 19 and I was pretty proud of it. I can still remember the doubt look my mom gave me when I told her I wanted to buy myself a car. I mean I was 19, it’s quite hard to be convinced that I am financially stable to get myself a car cuz the whole “earning through blogging” was pretty new that moment. I remember eyeing a Mazda 2 and a Suzuki Swift then. 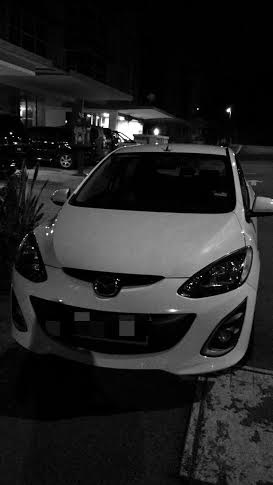 Both being hatchback cars and girly in the looks department, I ended up choosing a Mazda 2 and while my mom was attracted to the Mazda 3. 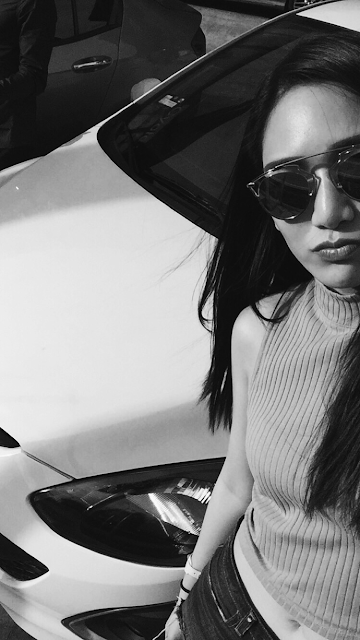 In the end, we both decided to buy the Mazda 2 and Mazda 3 together – both white colored hatchbacks. I remember being so excited when I first got my very own car. I could finally drive to everywhere I wanted and not bug my friends to fetch me out anymore. Instead, I even offered to fetch my friends around. It felt so good to have your own car, especially people like me who needs to travel a lot. As someone who loves spending time with my car, sometimes I will drive just an extra mile just to listen to music. After purchasing my first car at the age of 19, which was a huge achievement for me, I started to believe the whole law of attraction theory. If you want to achieve something so badly, you got to hold on to it, hold it, feel it, believe it and you’ll eventually get it. If you don’t, it means you don’t really want it as badly as you thought. Unfortunately, after so many ups and downs like a roller coaster ride in the past 5 years, it’s time for baby Vicky to go. I hope she’ll end up in good hands as I’ve been taking care of her really well. If you love your ride like I do, remember to service your car on time, send it for a regular wash and of course, use a quality engine oil brand. I personally recommend Shell Helix Ultra with PurePlus Technology – a fully synthetic motor oil made from natural gas without the impurities of normal crude oil that cleans your car engine inside out that keeps my car running at top performance at all times. No matter what car you drive, show it abit of love by giving it a quality motor oil so that it runs in tip top condition. Nobody wants to experience having a car breakdown in the middle of the road, right? Although it was a tough decision but I finally decided to let baby Vicky go and buy my dream car. I’ll keep you guessing for that. 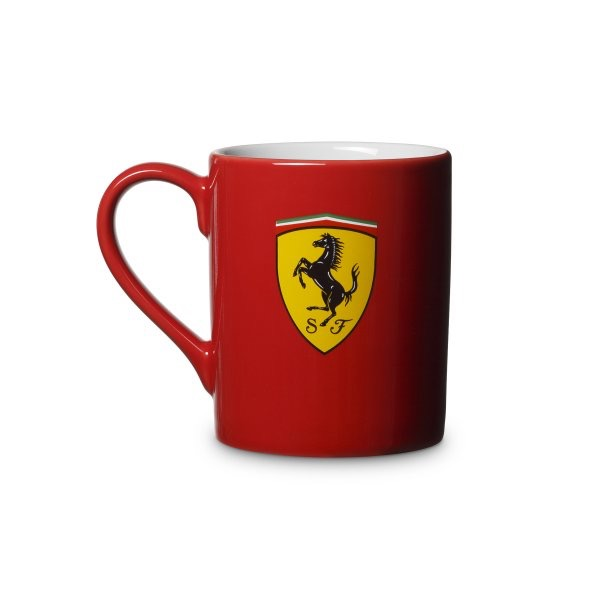 Also, here’s an opportunity for you to win an exclusive limited edition Scuderia Ferarri mug from the folks at Shell Malaysia. All you have to do is to answer this question. Don’t forget to leave me your contact details! The base oil using by Shell Helix Ultra is fully synthetic motor oil made from natural gas without the impurities of normal crude oil. Hello..the base oil that Shell Helix Ultra with Pure Plus Technology uses is natural gas. Sad to see baby Vicky goes..
a fully synthetic motor oil made from natural gas. "Shell Helix Ultra PurePlus Technology is manufactured through a revolutionary Gas-to-Liquid (GTL) process that converts natural gas into a crystal-clear base oil with virtually none of the impurities which are found in crude oil. 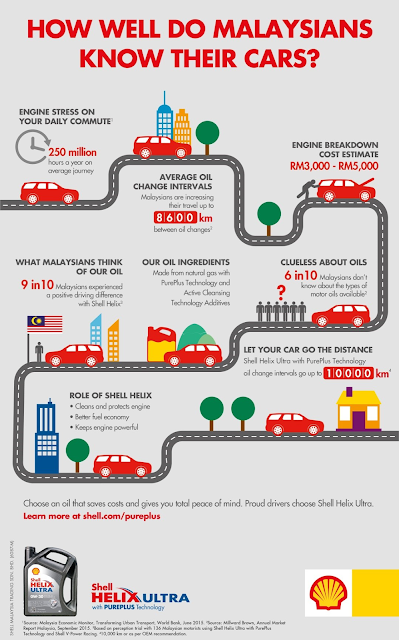 The result is Shell's most advanced synthetic motor oil to date." Natural gas is the base oil used to produce Shell Helix Ultra in Pure Plus Technology. The new Shell Helix Ultra synthetic line of premium motor oils with virtually none of the impurities found in crude oil. Shell Helix Ultra with Pure Plus Technology is using natural gas to produce the base oil. Thanks. the base oil is designed by natural gas. the base oil is deisgn by natural gas.